ATLAS project head Dr. John Tonry with a conceptual drawing for an ATLAS telescope. The project would use two of these 20-inch telescopes. After the close shave asteroid 2012 DA14 gave Earth last week and the unexpected meteor blast over Russia, it is all too be clear why some scientists have their eyes peeled for potentially dangerous space rocks. One team of astronomers at the University of Hawaii is developing an asteroid warning system to help guard against surprise impacts. Once it is ready in 2015, the new Asteroid Terrestrial-Impact Last Alert System (or ATLAS) will consist of eight small telescopes, each equipped with cameras of up to 100 megapixels in resolution. 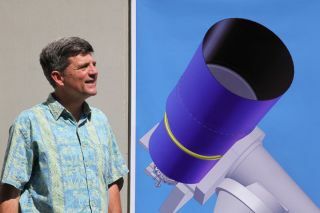 The telescopes will be on fixed mounts at one or two locations in the Hawaiian Islands. The system is expected to offer a one-week warning for a 50-yard (45-meter) asteroid that could wipe out a whole city and three weeks for a 150-yard (137-meter) space rock capable of wiping out a whole country, scientists working on the project said. "That's enough time to evacuate the area of people, take measures to protect buildings and other infrastructure, and be alert to a tsunami danger generated by ocean impacts," University of Hawaii astronomer John Tonry said in a statement. In Chelyabinsk, Russia, where the shockwave from a meteor explosion on Feb. 15 shattered windows across a wide area, the resulting damage injured nearly 1,200 people and damaged thousands of buildings. That devastation was caused by a 55-foot (17 m) asteroid that exploded high in the atmosphere. Had the larger asteroid 2012 DA14, which new NASA observations suggest is 130 feet (40 m) across at its longest point, hit the Earth, the entire city of Chelyabinsk would have been obliterated, scientists said. Asteroid 2012 DA14 fly by Earth on Friday at a range of 17,200 miles (27,000 kilometers), well inside the planet's fleet of communications satellites, but never posed an impact threat to the planet. The new ATLAS telescopes will scan the visible sky twice a night in search of faint objects that might represent dangerous asteroids. The project will take a closer and wider pass at the cosmos than the University of Hawaii's Pan-STARRS telescope array, which takes a month to complete one sweep of the sky in a deep, but narrow, survey. The ATLAS project is set to receive $5 million in funding over five years from NASA's Near Earth Observation Program. In addition to asteroids, ATLAS will look for dwarf planets, supernova explosions and other distant cosmic objects, the researchers said.